Our Presses range in size from 65 to 1500 Tonnes, and include Linear Transfer systems on some of the larger Presses. 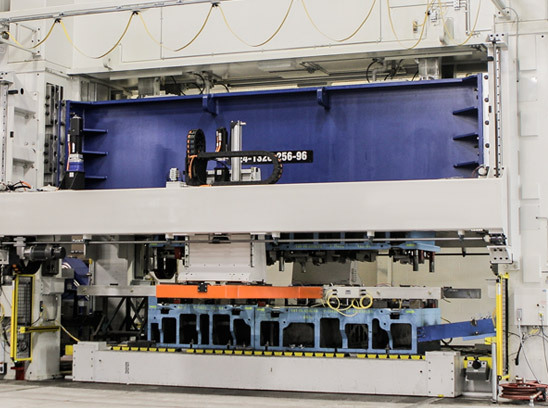 All of our Press lines are equipped with a state-of-the-art automated reject system. We manufacture parts from various types of materials, such as Aluminum, Galvanized, Stainless and High-Strength Steels with a focus on Automotive products that include Sunroof Systems, Seating Components, Structural Frames, Door Systems and Front-End Modules. Our Press lines are equipped with an ERP system that automates and integrates our core business processes. Production flexibility is demonstrated by our ability to run high-volume Progressive dies and Transfer Tooling, to low or medium volume production to suit our customers need.